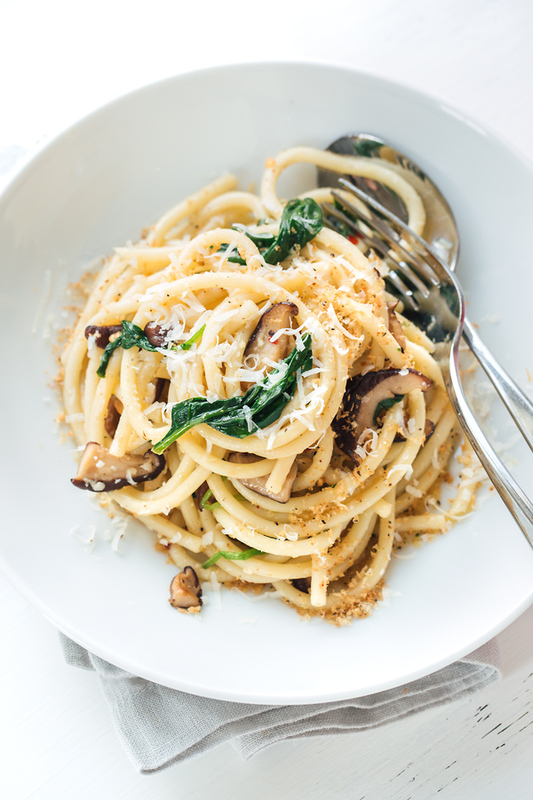 A bowl of this bucatini pasta with garlic butter sauce is rich and comforting with a baby spinach, earthy shiitake mushrooms, and a fragrant hint of white wine—it’s the perfect companion when a bit of sophisticated coziness is craved. 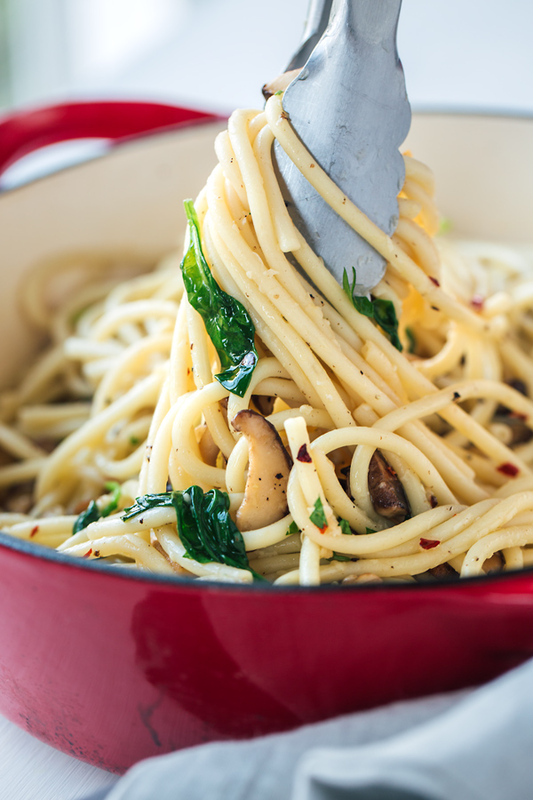 When it Comes to Comfort Food, Nothing Beats a Big Bowl of Pasta! Now that the summer has melted away into glorious fall, and the evenings begin to feel fresh and crisp and inviting of some good ol’ comfort food, my soul begins to long to partake in recipes that can be eaten out of a bowl; because for some reason, recipes from a bowl represent comfort and coziness to me. Even the thought of wrapping my hands around a warm bowl of something—a soup, a stew, or a rich dish like this bucatini pasta with garlic butter sauce, makes me feel all fuzzy inside, makes me feel that all is well with the world, and reminds me that there are so very many things to be grateful for, good food being a major one. Bucatini noodles, wonderfully thick and al dente, with that hole running through the center, are one of my favorite styles of pasta—I love a slightly chewy, full-bodied noodle that gloriously tangles up on the palette, slick with garlicky, buttery flavor in the case of this recipe, and bucatini beautifully does exactly that. It’s an ideal pasta to toss with a simple garlic butter sauce consisting of nothing more than a bit of good olive oil, aromatic garlic, rich butter, and white wine, one that takes mere moments to prepare. 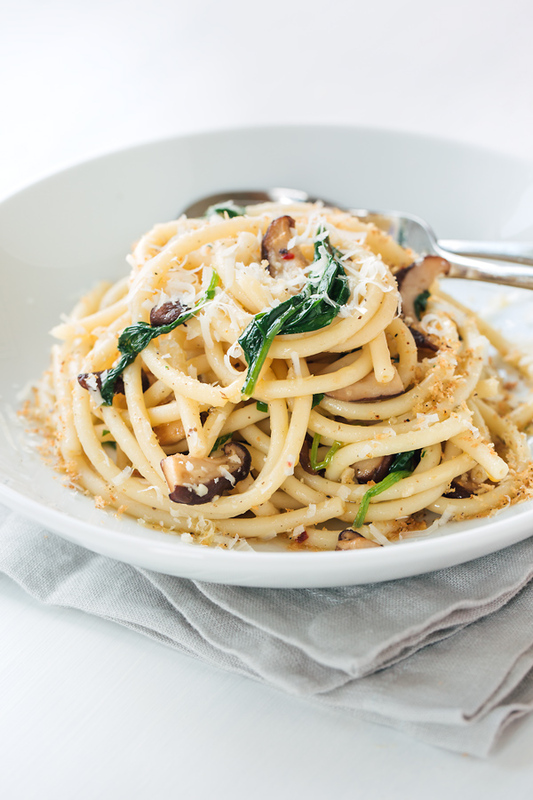 The finishing touches of a few earthy sautéed shiitake mushrooms and vibrant baby spinach leaves, plus a generous shower of freshly grated Romano cheese, and a sprinkle of toasted olive oil breadcrumbs, culminates in a meal that is my absolute favorite kind of “cozy food”. Can’t find shiitake mushrooms? If you can’t find shiitake mushrooms, you can easily substitute crimini mushrooms instead. Pasta substitution: Bucatini is the best for this dish, but you can certainly substitute spaghetti or even linguini if your market doesn’t carry it. Leave the wine out: If you’d prefer to go without the wine for this recipe, then simply substitute chicken stock, and add a good squeeze of lemon (about half a lemon) to give that hint of acidity. This flavorful bucatini pasta dish with only a small handful of fragrant ingredients is the perfect recipe for a weeknight meal when simple, cozy comfort in a bowl is what you crave—it’s on your table in 20 minutes! -Cook your bucatini pasta according to package instructions, or until al dente; keep warm in a large bowl. 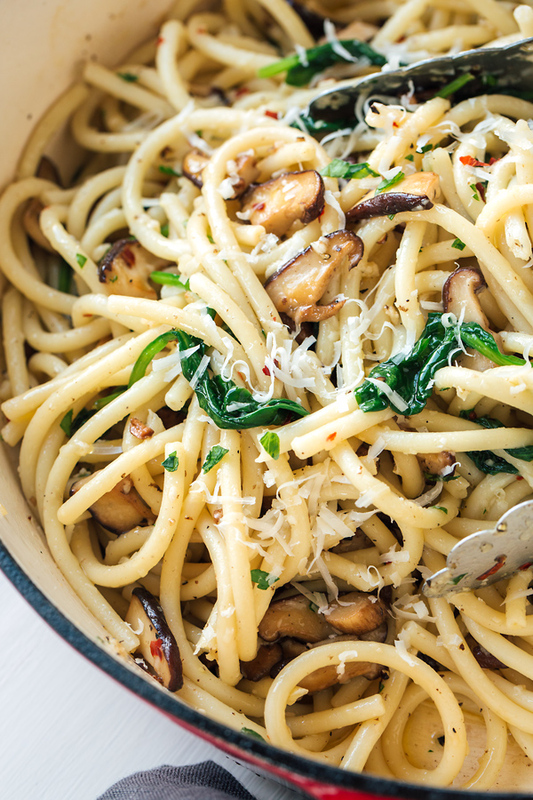 -While your pasta cooks, place a large pan over medium-high heat, and drizzle in about 3 tablespoons of olive oil; once hot, add in the sliced shiitakes mushrooms, plus a good pinch of salt and pepper, and saute for a few minutes until golden-brown; spoon into a bowl and keep warm. -Into that same pan you used for the mushrooms, with the heat now on medium, add in ¼ cup of olive oil, along with the garlic and pinch of red pepper flakes, and cook for a moment just until the garlic becomes fragrant; once fragrant, add in the white wine, along with the butter (it will bubble up a bit), plus a couple of pinches of salt and black pepper; simmer the sauce for a couple of minutes, whisking until the butter melts in and the sauce slightly reduces. 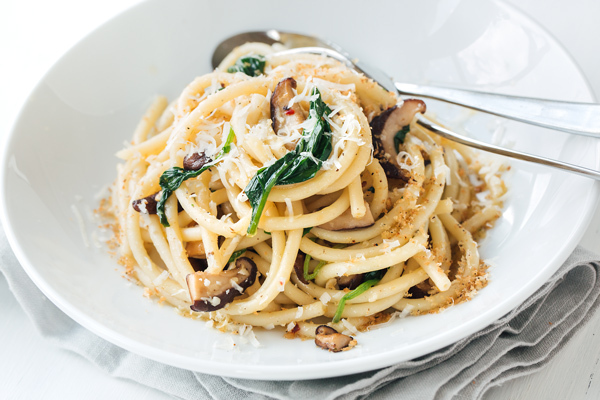 -Add the sauteed shiitake mushrooms, the baby spinach leaves, and the chopped parsley into the pan with the sauce, along with the cooked bucatini noodles, and toss gently to combine everything; add the grated Romano cheese, and toss that to combine. -Serve in bowls with extra Romano cheese and a generous sprinkle of the Toasted Olive Oil Breadcrumbs, if desired. -Place a small skillet over medium-high heat, and drizzle in the oil; once hot, sprinkle in the panko breadcrumbs, plus a good pinch of salt and pepper, and the granulated garlic, and stir to combine; toast the breadcrumbs in the oil, stirring constantly as to not burn them, for about 2-3 minutes, or until they become a deep, golden-brown; set aside in a bowl until ready to serve. Interested in another bucatini recipe? Check out this Sunshine Bucatini with Blistered Tomatoes and Broccolini! I just made this for dinner, and it was a HIT!!! I added a little bit of chopped sundried tomatoes, and a little bit of coconut milk. It is sooooo yummy, and I will be making it again! Angela, thumbs up on adding your own little twist to this! Sounds delicious! So glad it was a hit, and a recipe you plan on preparing again. Thank you for your comment. Greetings Ingrid. As a life long Italian, use to my Grandmothers and Mothers exceptional cooking, I rarely look for pasta recipes online. I must tell you that I am so happy (and my partner John as well) that I came upon your exquisite recipe. I doubled the recipe and have to confess that we ate the entire thing. We didn’t utter a word to each other until we had our fill. As a man that loves to cook and eat I felt compelled to express my deep gratitude for your fabulous recipe. I can’t wait to try more. Thank you so much, from the two of us. Frank, I cannot tell you how deeply your comment touched me! I instantly had a warm, fuzzy feeling in my belly, and a tremendous sense of gratitude for what you shared. I am so very glad that both you and John enjoyed the recipe so much, and I am so very excited that you plan on perusing and possibly preparing some more of our recipes! It almost seems a bit serendipitous that you stumbled upon this particular recipe, especially since, as you mentioned, you don’t typically look for pasta recipes online. When you have a mother and grandmother who are exceptional cooks, the way in which they prepare their amazing meals certainly gets passed down, and that becomes a part of your soul; and I’m sure that you know those dishes by heart and by taste, no written recipe needed, necessarily. So it makes me feel a bit extra honored to have had a little part in your special meal through my recipe, and I cherish that. Thank you for taking the time to share your experience with me, and I hope both you and John find comfort and enjoyment in many more of the recipes you find here! My son introduced me to bucatini pasta using this recipe last week, but he added sauteed sea scallops with lemon pepper. It was a scrumptious, indulgence. I will probably have to go to Dallas/Fort Worth to find bucatini, or maybe order it online. Not avail. here in Waco – Imagine that! LOL! Hi Joy, I’m so thrilled your son prepared his delicious versions of this dish!